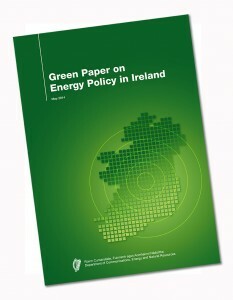 Have your say on Ireland’s Energy Policy! The Green Paper on Energy Policy has been published by the Department of Communications, Energy & Natural Resources (DCENR). A consultation period is now open and submissions are invited from all stakeholders. The paper has a number of sections and poses a series of questions relating to each section, some or all of which can be addressed in the completed submissions. Alternatively, you can submit your own views and opinions. The paper is pretty well written but I recommend reading it over the course of a few days as there is a lot to take in. This is a valuable opportunity for you to have your voice heard – make sure you use it! Closing date for receipt of completed submissions, by email or by post, is Thursday 31st July. The Green Paper can be found by clicking here.